There is no better place to see the parade on St Patrick’s Day Savannah Georgia then the Foley House Inn. The parade passes directly around the square in front of the Inn. Be warned that Savannah is known for hosting the second largest parade in the world and is said to draw in excess of 500,000 people. This religious and cultural celebration begins approximately two weeks prior to St Patrick’s Day Savannah Georgia parade. Some of these traditional events include the Investiture of the Grand Marshal, Greening of the Fountain in Forsyth Park, Tara Feis, Celtic Cross Mass and Ceremony, and Sergeant William Jasper Green Ceremony. On the morning of the parade, Mass is held at the Cathedral of Saint John the Baptist in historic downtown Savannah just 2 blocks from the Inn. The first parade held on St Patrick’s Day Savannah Georgia was in 1813, and has been held here every year since. The Parade is always held on March 17th unless that date falls on a Sunday…in which case the parade is held on Saturday, March 16th. The Parade is organized by the St Patrick’s Day Savannah Georgia Committee. Stepping off at 10:15 a.m. sharp, the three-hour St Patrick’s Day Savannah Georgia parade consists of over 350 units, including several U.S. military divisions, many award-winning bands, and the world-famous Budweiser Clydesdales. Some of the bands include the 282nd U.S. Army Band (Fort Jackson, S.C.), The Old Guard Fife and Drum Corps (Fort Myers, VA), U.S. Coast Guard Pipes and Drums (Norfolk, VA), Irish Air Corps Pipes and Drums (Dublin, Ireland), and many more outstanding marching units. Put this one on your bucket list. The parade can be viewed from in front of the Inn or from one of our balconies. 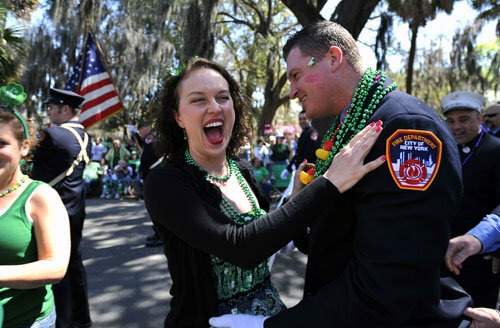 Each year, our bed and breakfast is completely booked for St Patrick’s Day Savannah Georgia parade, so plan ahead and make your reservation today. Please note: For St Patrick’s Day Savannah Georgia stays at our bed and breakfast, we require a 2-night minimum.